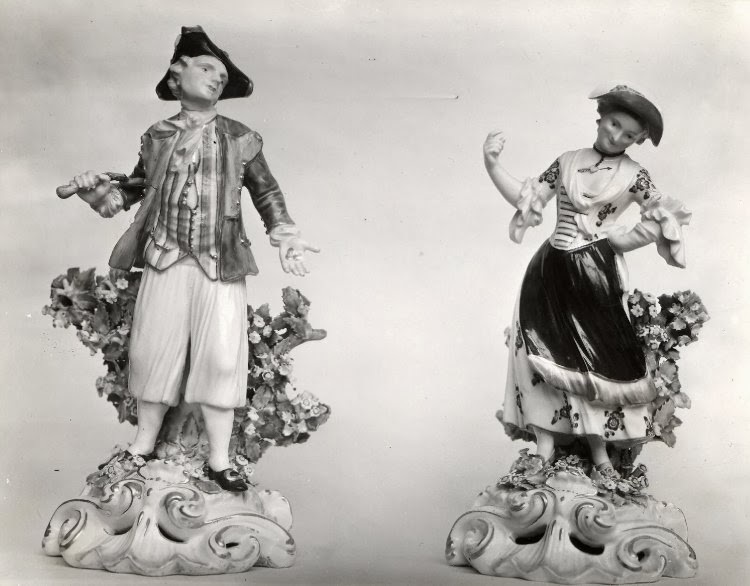 This pair of porcelain statuettes is in the collection of the National Maritime Museum, and dates to about 1765. The sailor leans toward his smiling lady, with gold coins in one hand, and a stick in the other. His black hat is cocked very far past the right eye, again giving it the look of being worn backward. His hat is trimmed in tape, and his hair is short, loose, and curly. Our tar's neckcloth is tied in a knot to the front, and a very light color, possibly white. The waistcoat is remarkably different from most other images: its stripes are vertical, rather than horizontal, there is more than one color to the stripes, the cutaway is more pronounced, and the length extends below the waist. We can conclude that this waistcoat is atypical for sailors. The seaman's jacket is a bit more common. The lapels are long and held by metal buttons, as are his slashed cuffs. His jacket has waist pockets, but no collar. The slops he wears are a remarkably clean white, matching his white stockings. His shoes have pointed toes and oval shaped buckles. We can probably ascribe the cleanliness of the figure, his unusual waistcoat, and fancy hat to either a successful voyage at sea (and thus the coins to court his lady), or merely the fanciful nature of such statuettes in the eighteenth century.